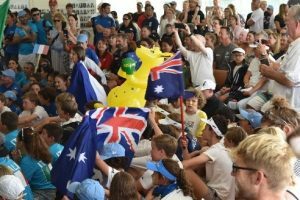 The 2019 Open Bic World Championships took place at Manly Sailing Club in NZ. A small friendly club about a 40 mins drive north of Auckland on the Whangaparaoa Peninsula. Australia was represented by 21 sailors with 8 of those being from WA. Consisting of RFBYC – Zach Sprunt, Drina Bucktin and Jenna Everett. MBSC – Annabelle Jones, Ben Robinson, Josh Robinson and Sam Williams. PDSC – Aiden Grove. 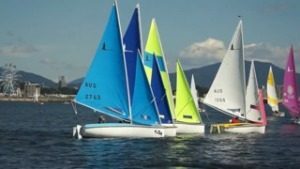 The fleet of 133 boats was split by age ranges with 64 boats in the U/17 and 69 boats in the U/13 groups. Sailors from 8 different countries took part. We arrived just prior to Christmas to collect our charter boats and get in a couple of training days before the event. The first two days of the event were the Manly Open, a practice regatta, in the lead up to the main event. This gave us the chance to get into our charter boats and experience the local conditions and check out our fellow competitors. Drina was in the U/13 fleet and the remaining WA kids and myself were in the U/17 fleet. After the Manly Open, we had a day off from racing and attended the Opening Ceremony at the local Manly Bowls Club. We were entertained with some great Kiwi Dancers and welcomed with a Haka. Russell Coutts then gave an opening address welcoming us all to the beautiful Whangaparaoa Peninsular. It was great to see all the countries come together and proudly waving their flags. The serious business of racing started on the 30th Dec, with a briefing at 11.30 and on the water for 1pm. The Race committees plan was to get in 3 races a day. With a goal of 12 races for the series. During the regatta we had plenty of changing conditions. The start of the Championships saw some light winds and building up to more moderate winds by the end of the regatta. My best finish in a race was a 5th towards the end of the regatta. My final placing was 16th overall and 5th female. Congratulations to Davide Mulas from Italy for taking out the 1st place trophy. Followed by Travis Wadley from QLD in 2nd and Leopoldo Sirolli from Italy in 3rd. Special mention to Zach Sprunt who finished in 5th place. 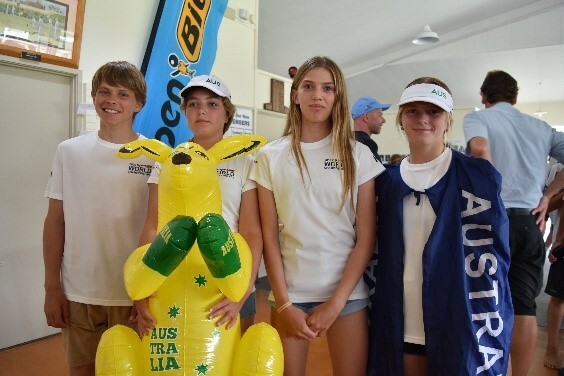 The U/13 results saw young Breanne Wadley from QLD take home the 1st place trophy, with Ted Houry from NZ in 2nd and Tiphaine Rideau from France in 3rd. Special mention to Drina Bucktin who finished in 4th place and as 3rd female. 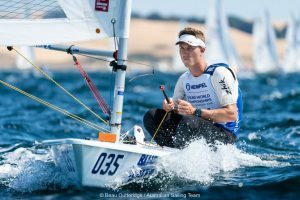 I really enjoyed the opportunity to compete against so many talented sailors and to make and renew friendships from around the world. I would like to thank Denis Jones for being our coach in the lead up to the trip and for his coaching and on water support throughout the event. To the Manly Sailing Club and Russell Coutts for your hospitality during the regatta. And to Royal Freshwater Bay Yacht Club and the Ron Tough Foundation for their ongoing support.